Managing incompetent and annoying employees is every manager’s worst nightmare. The reality is that no workplace is void of such employees who are a drag on the performance of their own teams and colleagues. If you are a manager or an employer, read on and find out how you can smartly manage annoying employees without getting into a messy situation. One of the easiest ways to deal with incompetent and annoying employees is to monetize performance, or in other words, put a price tag on different targets. In such a situation, an employee’s actual productivity is directly driven by how much money they can earn over and above their base pay. Similar to the tried and tested Carrot-Stick approach, make your employees work towards a particular task or target and lure them in with a reward, whether it is an incentive or a one-time cash bonus. Managers should remember that an incentive does not always need to be cold hard cash. In a recent article in TOI, Monika Tripathi, VP of a well known recruitment firm says "…The young task force is hungry for success and appreciate the flexibility to manage their time." In line with this, many FMCG giants like Hindustan Uniliver, Asian Paints and Jyothi Laboratories allow their employees to manage their work schedules including leave applications. In 2011, a statement by Google read along the lines of "…We provide individually tailored compensation packages that can be comprised of competitive salary, bonus, and equity components, along with the opportunity to earn further financial bonuses and rewards…" This was on the back of Google being voted as one of the top companies to work for in India, according to a survey by The Economic Times and Great Place to Work Institute. Managers are increasingly learning that utilizing talents and skills of even the most annoying employees is a smart way of converting a problem into a rewarding solution. Below are a few examples. If you have an employee on the floor who engages into a lot of gossip, make him/her your eyes and ears on the floor. Get that employee to report to you about the latest happenings to use it to your advantage. If you have an employee whose only skill is the ability to have great conversation, consider shifting him/her to a role that is communication centric. If you have an employee who never comes to work on time, you may want to consider allowing him/her to work from home if that is feasible with his/her job profile or complaint to your company’s policies. One of the classic principles of leadership and good management is to lead by example. If you want your employees to do something, show them how it is done by setting a prime example yourself. Because if you don’t, your employees may write off your orders and instructions to label you as a ‘someone who only preaches’ rather than ‘someone who does what he/she says.’ How do you think it would look if you harassed your employees to make it to office by 9 am when you don’t make it by 10 am yourself? As common sense suggests, employees will not heed to your advice until you do it yourself. That’s exactly what all managers need to remember and implement. If you find an employee repeatedly slacking and making little efforts to come in line with expectations, it is best to start keeping logs of his/her shortfalls. Firstly, this log will help you pin point the exact deficiencies in performance when you reprimand your annoying employee. It will help you accurately tell him/her where, when and how he/she needs to improve. Secondly, if the day comes where the employee needs to be deprived of monetary benefits or fired from his/her job, you will have a log which serves as proof and support for your actions. Managing incompetent employees may be easy for managers in small to mid-sized firms. However, when we talk about larger corporate houses, managers often leave tricky cases up to HR. After all, that’s what the HR guys are paid for, aren’t they? If you’ve been facing the wrath of an incompetent and annoying employee who refuses to heed your advice and change for everyone’s benefit, talking to a guy in HR may be your saving grace. Not only because the guys in HR are trained to deal with difficult employees but also because you can evade the liability of a future spat between the employee and the employer. After all, the last thing you’d want to be faced with is the trouble of Harassment or a Discrimination law suit. What to do if some of your seniors are annoying and your boss trust’s them? I think managers may redesign the job or transfer the employee in a different area that suits him/her better. How about firing them straightaway? I know its not pleasant but that’s what actually works. Yash, Although I agree with your premise, it is not always possible given the circumstances. 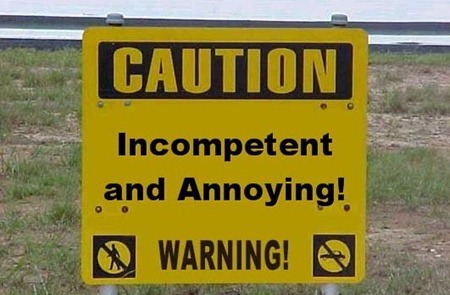 They may be good in one thing…but annoying and incompetent in other.